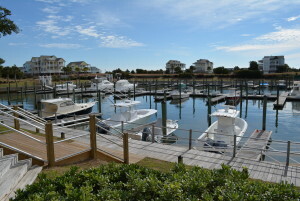 Located near Holden Beach is the waterfront community of SeaScape. With numerous walking and biking trails, you can fill your days with outdoor activities. In the mood to relax? Stroll along the walking trails to one of the natural conservation areas. Enjoy the viewing gazebo that overlooks a lilly pond or the larger pavilion, complete with teak furniture for dining or relaxing. There are plenty of places to spend some time with a good book or simply sit and take in the view. The community’s crowning jewel is a 75 slip deep-water marina. The marina boat house, with its large outdoor kitchen and dining area, overlooks the marina and has quickly become a hot spot for the property owners to gather and get to know each other. This community offers the best of coastal living. Quick access to the Intracoastal Waterway and Atlantic Ocean means residents can enjoy a few hours on their boats at a moments notice. Waterway homesites can have their own piers with docks and boat lifts right on the water. A community boat storage area means you won’t need to worry about storing your boat at your home. Among the amenities are a community clubhouse, swimming pool and tennis courts as well as an oceanfront property owners beach club on Holden Beach.